Like all of us raising multilingual children, nurturing our little ones' languages is one of the (main) focus of their childhood. We all have our little techniques using music, apps, books, activities that will catch our children's interests and thus enhance their learning. We, as a family, do rely on these quite a lot as we deal with four languages. Music, for example, tends to be mostly in Portuguese in our house. Yet, nothing beats real interactions with real people our children love. So when we found ourselves in need of childcare in the summer, we called upon the one person who cannot say no to a request from her son and grand-daughter. We called in Avó (the portuguese grandmother). This was a once-a-year opportunity. As expats, we do not have family close by and this was a wonderful week for LJ as a language learner and grand-daughter. 3. allow them both to have a bit more of a relationship. I recently reported on LJ's great English progress over the summer. But it seems this was the summer of progress in all languages (maybe to the detriment of German). During those few days with her Avó, LJ heard, and more importantly, spoke Portuguese. Avó was under strict instructions not to speak anything else. And it worked. LJ produced a few whole sentences (we had never heard sentences beyond two words before). Eu não quero uma cenoura. She even asked why Avó and I did speak 'like that' (i.e. English) making me feel very guilty for not speaking Portuguese. But I managed to convince her that she and I spoke English like Papa and I. Pff. All in all a very reassuring summer for us. LJ may not have the opportunity to speak much Portuguese but if she ever needs it, she should be able to manage. She understands a lot. Of course, a little immersion in the coming years may just be the thing she needs. We are working on it. Books, apps and films are great but nothing beats finding opportunities to actually use those languages, however financially expensive or rare these may be. My advice: go and find yourselves friends, playgroups, real people who speak that language! Obvious? Maybe, but we sometimes forget. 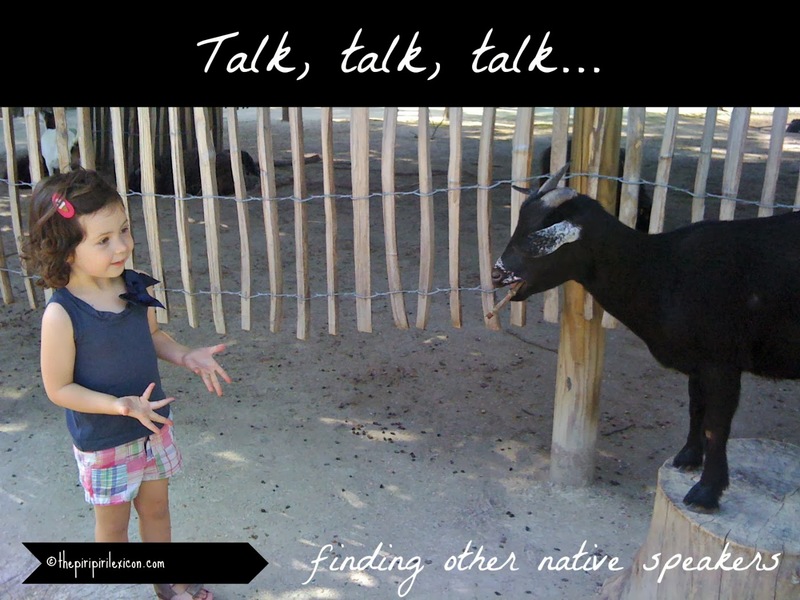 This post was written for the October 2013 blogging carnival on raising multilingual children. Hi! I'm new to your blog, but wondered about your thoughts regarding it taking longer for children to speak when learning more than one language. We speak German and English to our son who is 17 months old. He seems to understand more than he speaks. He only says maybe two real words. I've been told it may take longer because of the different languages and just wondering if I should be doing more. Thanks! Some children are early talkers, some lateta'kers. some are monolinguals, other bilinguals. Research shows that lutlilinguals fall within normal ranges whenit comes to first words and acquisition. 17 months is still within normal range. Tehre is nothing to worry about. It is commonly believed that bilinguals take a little longer as they have to process more than one language. This may be true for some aspects of language. I wouldn't worry. As long as he understands you and others there is no problem. Just make sure you talk to him and not at him. Make sure you talk as much as ypu can. Describe everything that happens around you, how you feel, how he might feel, what he can see, etc. The more you and others around hil talk, the more chqnces he has to learn words and then produce them. Now Annabelle you know you have to speak Portuguese with Avó, too! LOLOL That is so cute of your daughter, and what a good language observer. Don't make me more guilty than I feel! Great post! I actually agree with you. It's even better to converse with someone to help you really excel your skills in speaking the language. It's different from knowing what a word means than to actually converse with someone and use appropriate words. That is why I have a tutor at http://preply.com/en/portuguese-by-skype who not only teaches me the language but is also there for me to converse with. It actually helps if you speak it all the time for you to respond immediately and talk naturaly than to think of what you should say.